Dallas, TX – (September 24, 2015) – Mohr Partners, Inc., a global corporate real estate advisory firm, is proud to announce that the company and its supporters have raised nearly 90 percent of the ultimate fundraising goal for its upcoming Mohr Partners’ Golf Classic event benefiting Jonathan’s Place, a non-profit organization helping abused and neglected children in North Texas. With less than two weeks from the event date, the benefit is just a few thousand dollars short of reaching the fundraising target. And, there are still a few spots left to get involved and attend this Las Vegas themed event. The Mohr Partners Golf Classic will be fun and eventful featuring a live DJ, competitive games, prizes, and a silent auction. All event attendees will enjoy complimentary food and beverages. 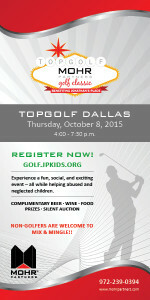 The annual Mohr Partners Golf Classic benefiting Jonathan’s Place will be held at the Topgolf Dallas location (8787 Park Lane) on Thursday, October 8th, 2015 from 4:00 p.m. to 7:30 p.m. New this year, the event is welcoming non-golfers to show their support of Jonathan’s Place by purchasing a ticket to “Mix & Mingle” for $75. For golfers, single tickets are $150 and for a team of six the cost is $750. Sponsorships begin at $1,000. To register for the event, click: www.golf.jpkids.org. If you would like to contribute to the work being done at Jonathan’s Place, you can register or make a donation by visiting the organization website: www.jpkids.org/give.